Rating: Liked to love -- I bet my estimation will grow as time goes on. Did I finish? : Totally -- couldn't put it down. One-sentence summary: At the end of his life, author and lover-of-many H.G. Wells reflects on his life. Do I like the cover? : I love it -- the vintage illustrations of women suggest Wells' lovers, or at least, his interest in women and there's something about the font that is ugly and yet, so appealing. First line: In the spring of 1944 Hanover Terrace, a handsome row of Nash town houses on the western perimeter of Regent's Park, is looking distinctly war-worn. Buy, Borrow, or Avoid? : Buy or borrow if you like literary historical fiction. Why did I get this book? : Writers on writers -- I can't resist! Review: What I love about historical fiction is that the past is given color and brought to life in a way that feels real, that invites me to see myself and my own life in the actions and events of the characters -- or, forces me to examine my own assumptions and biases (more on that later). This was my first David Lodge novel so I didn't know what to expect; I've long wanted to read his take on Henry James but haven't gotten to it (someday, someday). This novel, centered on H.G. Wells, covers my favorite historical eras and features many historical figures I like. The novel opens in 1944 with Wells' close acquaintances talking about his diagnoses of liver cancer. I wasn't immediately sucked in as I found Lodge's narrative style a bit awkward and I wasn't sure I was going to like any of the characters. On page 12, the story turns into an interview, essentially, as Wells imagines someone grilling him about this life. I originally resented this technique: it felt too clever, too meta, too 'on last week's episode'... but as the novel progressed and the interviewer started asking pointed, hard questions (the kind I wanted asked), I had this grateful a-ha! The interviewer injected some accountability and culpability I needed in order to respect the problematic character of H.G. Suddenly, I found him less unappealing; I found some places to understand him. Still, I wasn't wild about Lodge's writing style. There were long chunks in which I forgot I was reading a novel; this could have been a biography lacking footnotes. Which isn't to say the book was bad, but rather, there was a lack of drama. It was at these times I missed our interrogator: I wanted a foil, or a mirror, something to slice beneath the well researched biography to expose the nerves. There's quite a lot of quoted correspondence and excerpts of reviews, which again gave the impression of nonfiction. Where the book worked for me was when Lodge focused on Wells' romantic and sexual relationships; much of the last portion of the novel focused on Wells writing and as I haven't read much of him nor enjoyed what I have read, I found the section dry and a bit boring. Now: about my assumptions and biases and those romantic and sexual relationships. Reading this book was an experience in self-reflection, as my puritanical self went nuts hating on Wells for his sexual relationships. Lodge's H.G. saw his relationships and passades (Wells' term for his flings) as something necessary, sustaining, and inspiring; he perceived his wife and numerous lovers as being (essentially) comfortable with his attitudes about Free Love. I couldn't help but see the inequality in both his philosophy and practice of Free Love and I'd get all huffy every handful of pages or so, irritated on behalf of the numerous women he ran through. Still, every time I thought I'd quit reading, the interviewer would emerge and ask some scathing question that echoed what I was thinking, and it gave me a place to be vindicated and see Wells' angle. At the end of this book, I found myself feeling very conflicted. As in my favorite historical novels, I found myself caught up in the life of the main character, and in this case, I didn't (couldn't, didn't want to) hate H.G. I still felt strongly for his lovers, quite protective of them, and yet, a bit sad as the story wound down and I was faced with H.G. 's death. I was made uncomfortable, provoked, soothed, entertained, and educated by this meaty novel (nearly 500 pages) and I heartily recommend it to anyone who likes literary hist fic. 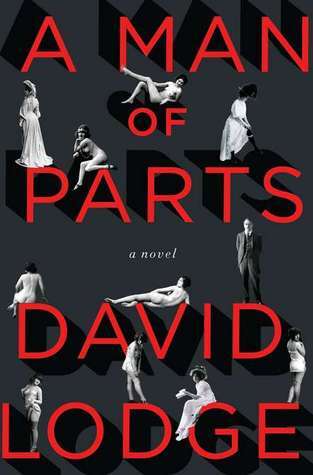 The publisher has offered an amazing giveaway: a copy of A Man of Parts and a copy of H.G. Wells' classic War of the Worlds! To enter, fill out this simple form. Open to US/CA readers, closes 10/14. I'm a huge fan of novels about real people, and this one sounds so interesting. I haven't read Lodge before either, but I'm eager to see what else he's done too. Thanks! Ooh! I'm a big fan of Lodge's fiction. This sounds very good. Adding to the TBR list. I think this sounds fascinating, and not only is it a genre that I love, but your review has made me quite curious and eager to find out the more secret side of Wells' life. A great review of a very intriguing book, I think! Thanks for sharing it! This sounds a little like my reading of The Paris Wife. It was hard to hate Hemingway, because clearly Hadley didn't, but I couldn't get past his really bad behavior. I do like literary hist. fic., so I may check this out. Thanks for your review! @Carrie: I've seen reviews that say he's done something very similar here to his Henry James novel, and if that's the case, I'll pick it up. @Bev: I'm a new fan -- I've got his Campus Trilogy waiting to be read now! @Heather: The tawdry details were shocking but Lodge isn't graphic or salacious. It was very tame in that sense, given how many lovers Wells had, and I appreciated that. It was a great book. @Col: Yes, that sounds about right -- and is why I haven't picked up the Paris Wife yet. I'm so judgmental and I have a very hard time keeping distance between myself and characters I empathize with. Wow, this sounds really good! I haven't seen it around the blogosphere though, so thanks for sharing it! You seem to find the most fantastic-sounding books! I like this review for its honesty...I've always been fascinated with HG Wells. Sounds like a great combination of historical fiction in WWII and with HG Wells. You've been reading some great books lately. I've enjoyed a couple of Lodge's novels... adding this to my list! Ohhhh I think I'd like this one (though when I read it I'll have the same Free Love issues you did!). I read Author Author for class a while back. If you enjoy author-on-author novels and haven't already read it, check out Colm Toibin's The Master about Henry James. It's beautiful.